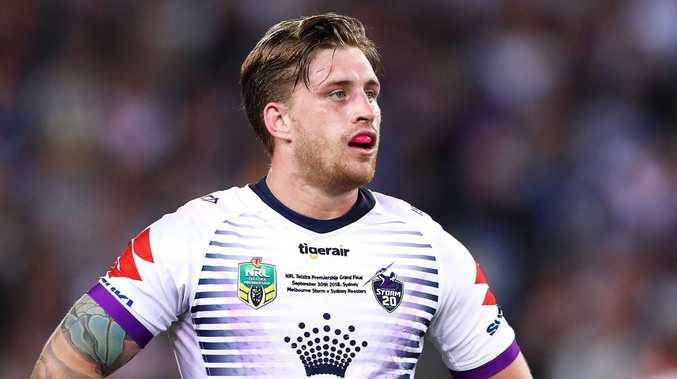 MAL Meninga insists Cameron Munster is a changed man despite the Melbourne playmaker's NRL grand final fine for kicking an opponent's head. Meninga will welcome back Munster to the Kangaroos' fold for this month's Tests against New Zealand and Tonga after the Storm pivot escaped suspension and copped a $1400 fine for what he described himself as a "brain explosion". The last time Munster was in the Kangaroos camp, Meninga sent him home from the 2017 World Cup campaign to receive some home truths from Storm coach Craig Bellamy after a training dust-up with teammate Ben Hunt. But Kangaroos coach Meninga said he had no problem with Munster's green and gold return despite the Melbourne star's "little outburst" in the NRL grand final loss to Sydney Roosters. Munster received the contrary conduct fine for booting Roosters centre Joey Manu in the head late in the Storm's defeat, ensuring he was sin-binned for a record second time in the season decider. Meninga said Munster was a natural fullback but had impressed stepping up in the Storm halves in the absence of Roosters recruit Cooper Cronk in 2018. "He's had a terrific year on and off the footy field," he said. "I have been speaking to Craig (Bellamy). He has matured a tremendous amount through the year, which he had to. "Cooper Cronk wasn't there any more and playing in a position he probably doesn't want to play. "He wants to play fullback. So he's matured a lot and handled his rise really well all year." Meninga hoped to have seen a glimpse of Munster's new Kangaroos halves combination with Daly Cherry-Evans in Queensland's State of Origin III win. Cherry-Evans revelled in his first Origin in three years to link with Maroons halves partner Munster and inspire a game three victory. "Cherry has been terrific all year and been a great leader at Manly who have been in turmoil the past 12 months or so," Meninga said. "And you saw their connection when Cherry came in and blew everyone off the park with his game (in Origin III). "I thought Cameron combined well with him in game three so hopefully we see a bit more of that in the next few games." Australia play New Zealand (October 13) and Tonga (October 20) in Auckland.